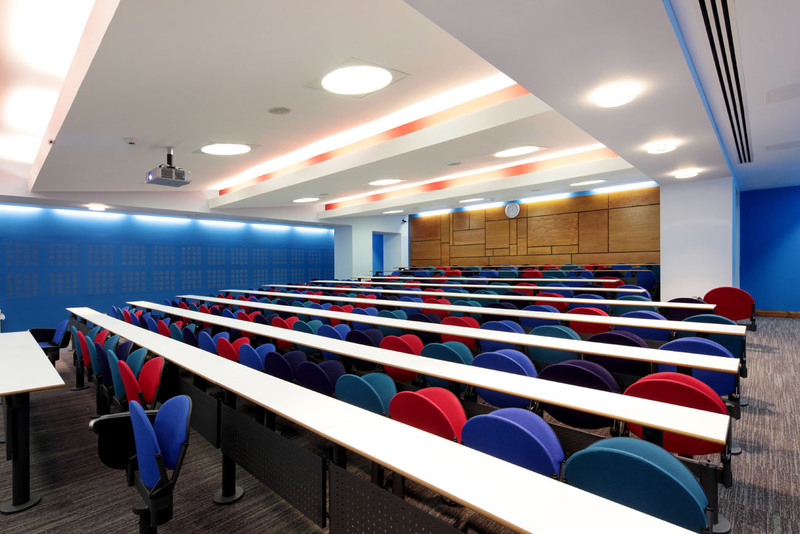 Although a relatively simple refurbishment project, the University of Glasgow was keen that the renovation of the Rankine Lecture Theatre result in a unique space that correctly reflected the goals of University. 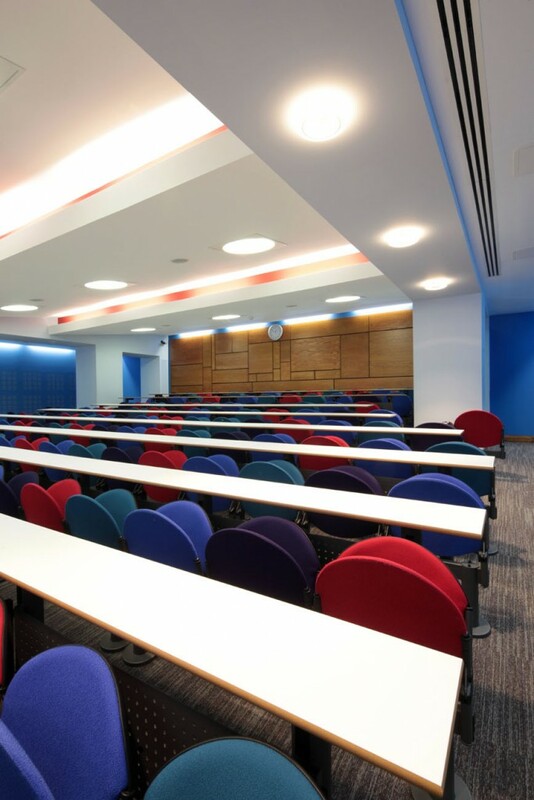 The University of Glasgow insists that all lecture theatres are unique and memorable and as such ECD was asked to design a new interior for the Rankien Lecture Theatre (LT 408). In its existing condition the lecture theatre was featureless. However as the building had a strong concrete structural theme, it was decided to celebrate these elements and use them to frame the seating area and divide the theatre into 3 distinct zones – seating, aisle and presentation area. A feature ceiling and rear wall were sculpted and lit to enhance each element and create a range of ambiences. In order to meet new standards for walkways and desktops the redundant sound room to the rear of the lecture theatre was demolished enabling the room to be extended to achieve the desired capacity of 150. Issues of visibility arising from the room low head height were resolved by staggering the seat rows whilst a bespoke hydraulic lectern was designed to minimised the use of space in the tight area at the front of the theatre and enable the lecture presentation area to be further DDA compliant. Finally, as the Rankine Lecture Theatre is dedicated to Sir Alistair Frame, ECD created a new biographic feature wall at the lecture theatre entrance.